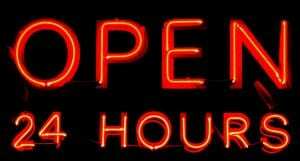 Open 24 hours graphic, red text on black background. The Northampton Square and Cass libraries will open for 24 hours a day, 7 days a week during City’s main exam and assessment period. Bookable study spaces will be available at both sites to reserve a seat in advance. At Northampton Square our Occupancy Chart will be back on Level 2 so you’ll know which floors are currently busier than others, plus each library will have additional security staff working through the night. 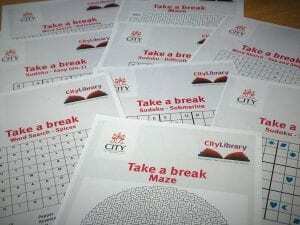 We’ll also be running our #TakeABreak campaign throughout 24/7 offering tips, advice, puzzles, colour-me-calm sheets and a weekly prize draw, all to encourage you to pause, refresh and recharge in between. Thanks to everyone in advance for showing consideration to local residents when entering and exiting university buildings through the night, this goes a long way to helping ensure we can stay open for longer at this busy time of year. Detailed opening times can be found on the Library website.